Skip Kelly Productions: Greek Gas Station Wedding! I don't know why, but this story just makes me so happy! 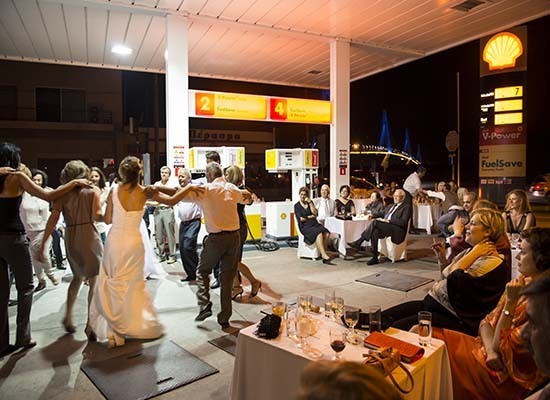 A photographer was scouting locations in Greece for a photo shoot when he stumbled upon a wedding in full swing... at a gas station! 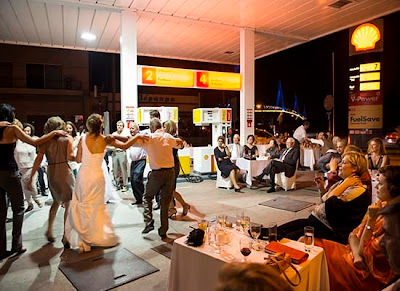 Apparently the happy couple was strapped for cash, so the groom managed to convince his bride to hold their reception at the family gas station! It's a heartwarming story and the full slideshow of pictures is available on The Huffington Post. Enjoy! Skip Kelly Productions has earned an "excellent" review rating on Google, won the 2012 & 2013 Wedding Wire "Bride's Choice" Award and was voted "Best of Jacksonville" in 2012 by the readers of Jacksonville Magazine. This past year, Skip was chosen as the Music Director for Jacksonville Fashion Week, and hosted multiple events for the Belk department stores, Fox 30, Sephora, Massage Envy and CBS47, to name just a few. Now settled in Jacksonville, FL and married to celebrity makeup artist Paulina Perez, he is bringing his unique, top-level experience to the local entertainment scene. If you are looking for aJacksonville Wedding DJ, or a DJ for your special event, visit http://skipk.com for more information.